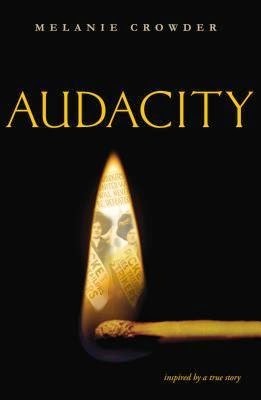 Audacity by Melanie Crowder. Grades 7+ Philomel Books, January 2015. 400 pages. Reviewed from ARC provided by publisher. Imagine going to a job every day where you're locked in, not allowed bathroom breaks. You have to work long hours in a dusty, dark room, breathing in fibrous dust. The foreman can touch you, can yell at you whenever he wants. For this, you're paid barely enough to stay alive. You have no recourse for complaints. If you complain, you might get fired. If you're sick and can't come to work, you'll be replaced. For many working women at the turn of the 20th century, this picture was reality. Clara Lemlich, an immigrant from Russia, couldn't stand it. She wanted to stand up for her own rights and the rights of thousands of working women and girls. It was not an easy fight. Although unions were forming for men, they did not allow women to join. Based on the life of real-life worker activist Clara Lemlich, this is a novel in verse that brings history to fiery life. This novel in verse illustrates the terrible working conditions in the garment factories of NYC at the turn of the century and the struggle that women faced to get better working conditions. It's an engrossing story, starting with Clara's young-adult-hood in Russia and the family's journey to America. Not only did Clara face violence and oppression in the workforce, she faced it at home, too. Her father forbid her to get an education, so Clara went against his wishes to read, learn English, and study, even though her father beat her for it. Crowder does an admirable job of making this a personal story firmly set within a larger historical movement. The reader clearly sees Clara's personal struggles - she gives up her dream of education and becoming a doctor in order to see her cause through. She's not afraid to face violence - she faces it at home from her father and she faces it on the streets as she speaks out for women's rights. A detailed historical note lays out just what liberties Crowder took with Clara's story and talks about how lasting change came about only after the tragedy of the Triangle Factory fire. This is a great choice for teens interested in American history, particularly women's history. Brave Girl: Clara and the Shirtwaist Makers' Strike of 1909 by Melissa Sweet. Although this is a picture book aimed at younger readers, it could provide scaffolding for this novel and would work as a class readaloud. Flesh and Blood So Cheap: The Triangle Fire and its Legacy by Albert Marrin. This is a good choice for teens who are interested in the history of this book and want more information. Like Water on Stone by Dana Walrath. Although not thematically similar, this historical novel in verse may appeal to teens who enjoy the verse format and historical detail of Audacity. Uprising by Margaret Peterson Haddix. This historical novel examines the 1909 shirtwaist strike from the points of view of three different young women - two immigrants and a girl from a wealthy family.